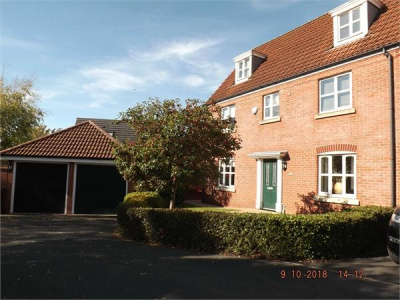 Beautifully presented FAMILY home over 3 floors in an unenviable spot over looking open farm land. 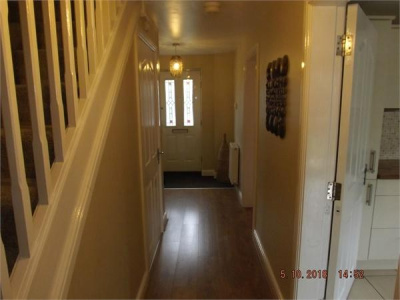 Boasting 5 DBL bedrooms, Lounge, Dining Room, Kitchen/Diner with breakfast bar, Utility Room and downstairs WC. To the 1st floor there is the Master with Ensuite, 2 further Bedrooms and a Family Bathroom. 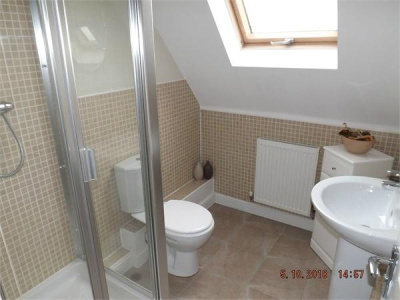 The 2nd floor has 2 Bedrooms and a further Shower Room. 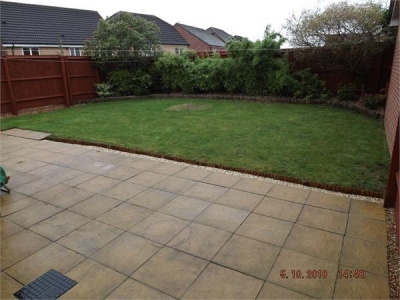 Externally the property has ample parking as it enjoys the corner plot, with further parking in the oversized Double Garage. 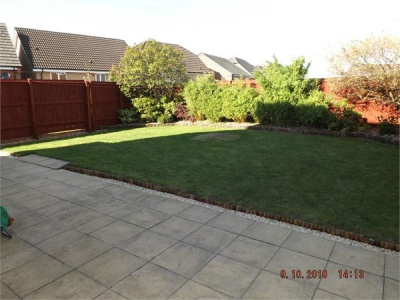 A large Lawned area to the rear with a patio running the full length of the house. Coming in from the front door the entrance hall has laminate flooring with shoe mat, housing the alarm pad, telephone point, smoke alarm and is warmed by 2 central heating radiators. 19' 9" x 11' 3" (6.03m x 3.43m) The lounge has a bright an airy feel with light coming in from both the front window and rear patio doors. The central focal point lies in the wall mounted electric effect fire. With Tv and satellite points, electrical sockets and a coved ceiling. 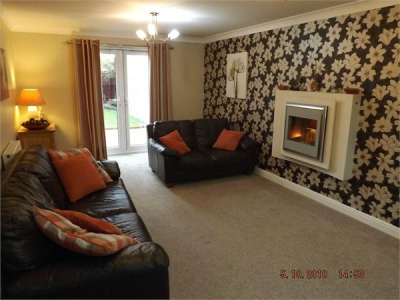 There is coving to the ceiling, neutral carpeted flooring and has two central heating radiators. 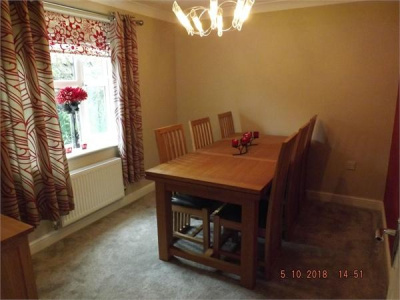 10' 11" x 8' 10" (3.34m x 2.69m) With a window to the front elevation, neutral carpet, central heating radiator, electric points and coved ceiling. 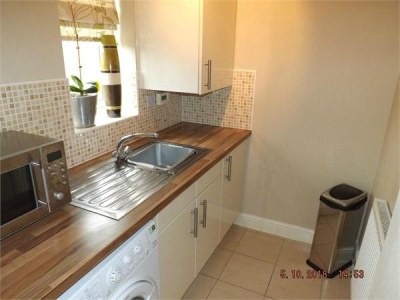 With low level WC, sink, tiled flooring, extractor fan and central heating radiator. 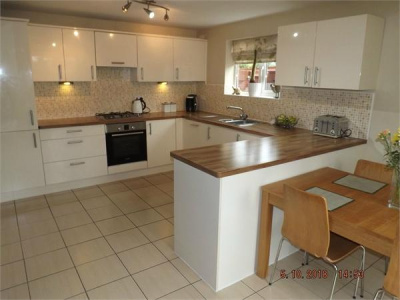 16' 8" x 11' 1" (5.07m x 3.38m) Well presented modern kitchen/ diner with breakfast bar. Within the large selection of wall and base units it also houses integrated fridge, freezer and dishwasher. There is an electric oven and gas hob with extractor over. 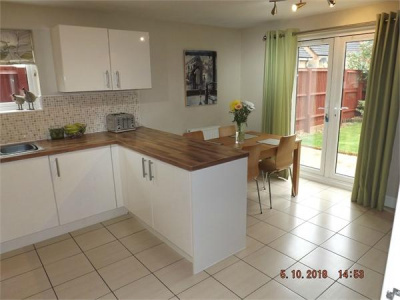 The tiled flooring covers the whole kitchen and separate dining area, with light coming in from the side window and rear patio doors out onto the rear garden. With a one and a half stainless steel sink bowl, under pelmet lighting and two 3 point spots. 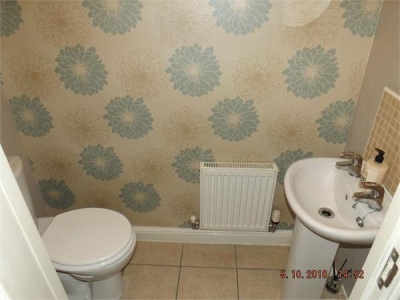 Two central heating radiators and archway into the utility room. 6' 11" x 5' 3" (2.12m x 1.61m) With window to the rear elevation, plumbed for washing machine, a selection of wall and base units housing a modern Baxi combi boiler and a stainless steel sink. 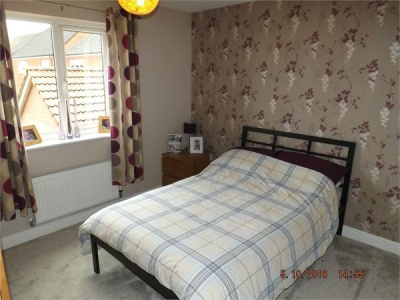 Neutral carpet, a storage cupboard with a central heating radiator, window to the rear and a smoke alarm. 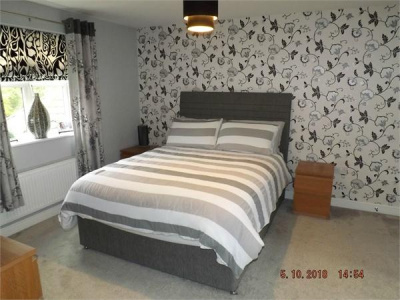 12' 9" x 11' 8" (3.89m x 3.56m) With a window to the front elevation, neutral carpet, TWO built in double wardrobes, central heating radiator, Tv and telephone point. 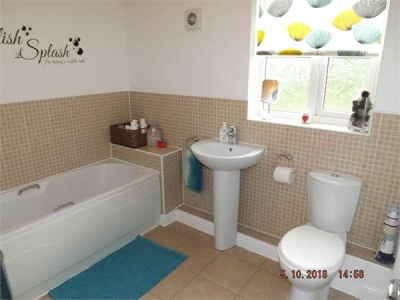 9' 1" x 6' 9" (2.77m x 2.07m) With low level WC, sink with vanity unit, Double shower cubicle, shaver point, radiator, tiled flooring and window to the rear elevation. 11' 3" x 9' 8" (3.42m x 2.94m) With a window to the rear elevation, neutral carpet, central heating radiator and electric points. 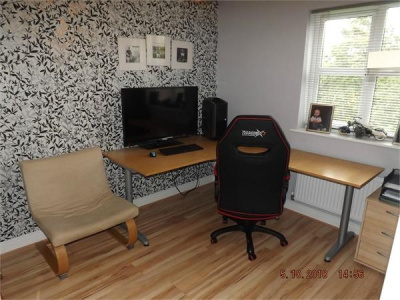 9' 11" x 8' 6" (3.03m x 2.58m) With a window to the front elevation, laminate flooring, central heating radiator, Electrical and telephone point. 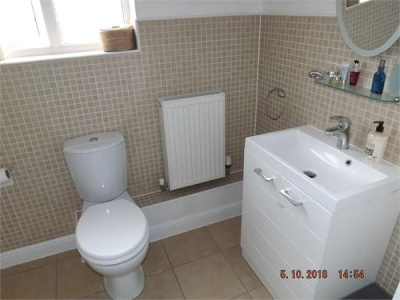 9' x 6' 6" (2.75m x 1.97m) With a window to the front elevation, Bath with shower over, Low Level WC, Sink, central heating radiator and tiled flooring. 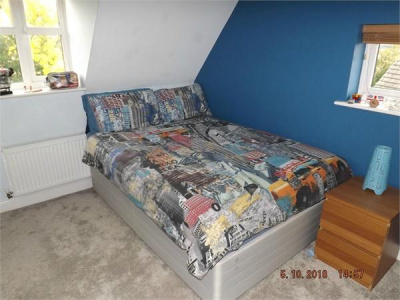 With a neutral carpet and storage cupboard. 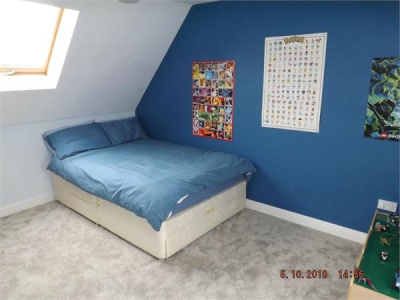 13' 9" x 11' 7" (4.19m x 3.54m) With a window to the front elevation and velux to the rear, neutral carpet, built in double wardrobes, central heating radiator, Tv point and attic access. 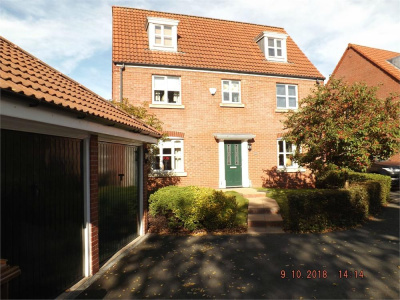 11' 3" x 13' 9" (3.42m x 4.19m) With a window to the front & side elevations, neutral carpet, TWO built in double wardrobes, central heating radiator and Tv point. 7' 1" x 5' 8" (2.17m x 1.73m) Servicing the 2nd floor bedrooms the bathroom houses a shower cubicle, low level WC, sink, tiled floor, extractor fan, central heating radiator and velux window. Leading from the driveway and garage the raised lawned area and paved flags leading to the front door. With a selection of mature trees. 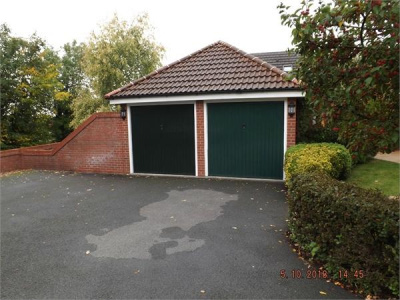 With two separate up and over doors, the driveway leading to these can house up to 4 cars providing ample parking. The garage also has power and light.